Solomons bus service was started in 1989 by Leon and Sharlette Solomons. The service came about because they saw the need for the schoolchildren of the Blue Downs and surrounding areas to be transported to school. The bus service was started with one mini bus, and now we operate luxury, semi luxury and contract buses as well as mini buses. 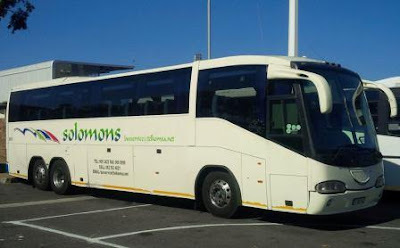 Currently Solomons Bus Service provides a transport and shuttle service in the Cape Town area for university, technikon and schoolchildren as well as the general public. Solomons core business is the transportation and shuttle service of people from one point to the next. They offer a pick up service from one point and a drop of at designated point. 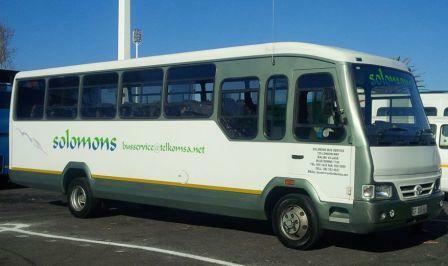 They offer shuttle services to airports, hotels, the V&A Waterfront as well as Wine land tours. They also offer tour group trips to various destinations across South Africa. These include from 12 people to sixty people at a time. R450 per person. Door to door pick up and drop off. R250 per person door to door pick up and drop off. 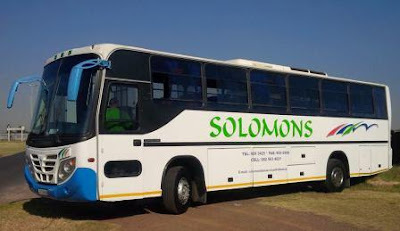 Solomons Bus Services helps you find the right tour at the best price as well as private transfers to make your experience in South Africa even more special and unique. Transfer are done daily upon booking at all times to and from Cape Town Airport. Minimum 2 passengers. They offer private transfers from any hotel or Guest house in Cape Town and close surroundings. Minimum 2 passengers. Luxury bus hire options range from 22 to 52 seater options – larger groups are easily catered for by booking combinations of the Luxury buses in their fleet with the expert guidance of their Ops team. 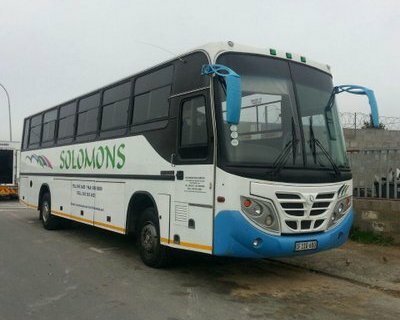 Solomons Bus Services has been operating in South Africa for many years and has provided versatile and reliable luxury bus transport solutions to both domestic companies and international visitors.